The UofL Poster Printing process is not as complicated as it looks as long as you follow these simple steps. Visit https://tele1.louisville.edu/webapp/MainLogon.aspx and log in with your UofL username and password. Remember that the poster will be ready 24 hours after submission in Dental Building room 54. Always allow yourself enough time. In times where lots of folks are needing posters printed such as R!L it is best to allow at least 2 business days for turn-around. Make sure that the email (discussed below) has the poster name, job name and contact name so that they can be associated with one another. 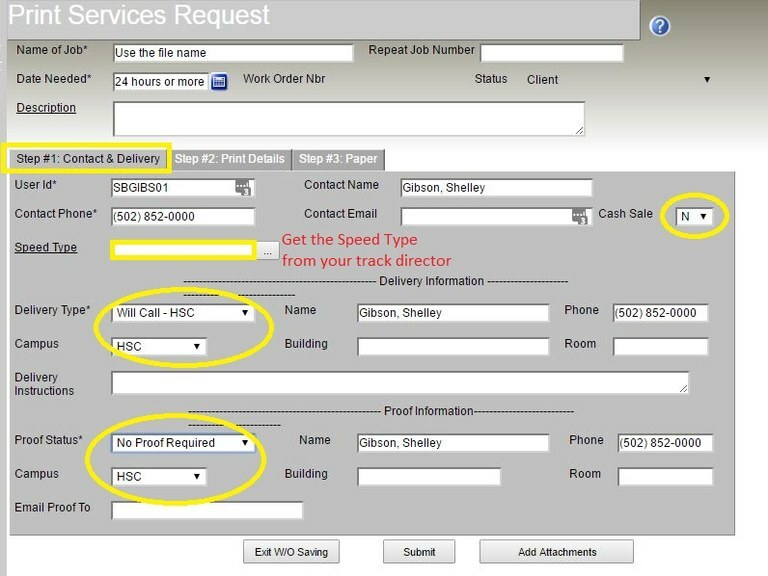 In the upper left side of the screen click on "Printing Services Work Order". In the lower left side of the screen click "Add New"
These boxes may offer you options, but there are no options. You must select the exact selections seen in the following images. An email form should appear when you click Add Attachments. If it does not, save and submit the form you just filled out and email your attachment to the following address. Make sure to list the name of your project (this should be the same as your file name). If you have any questions, please contact Stephen Alfred at 502-852-7492.